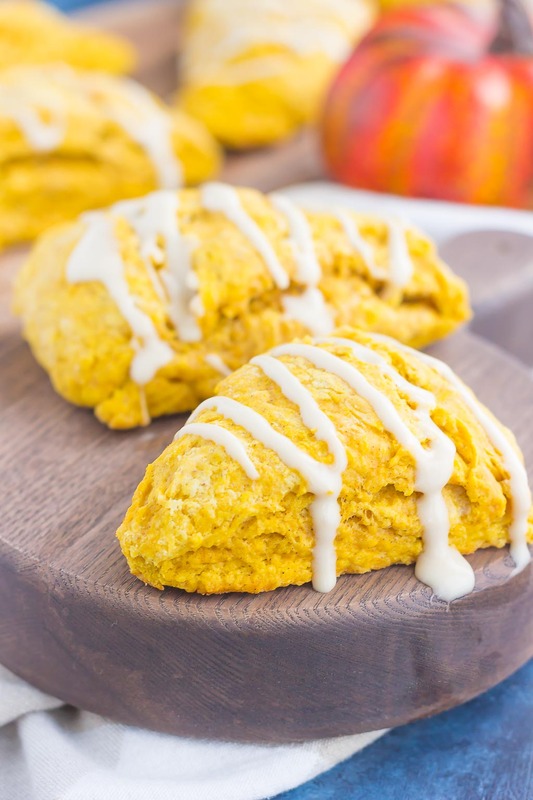 These Pumpkin Scones with Maple glaze are flaky, soft, and buttery. 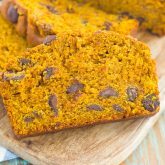 The edges bake up crisp, while the insides are tender and bursting with pumpkin flavor. 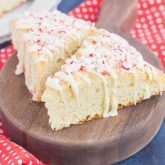 Topped with an irresistibly sweet maple glaze, these easy scones make the perfect breakfast or dessert! Are you as excited as I am that we’re in the middle of pumpkin season? I hope so, because I’m not about to slow down yet, even though we’re heading into mid-November. Pumpkin anything is a favorite of mine, but I have a special love for pumpkin baked goods. 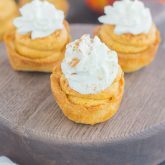 These Pumpkin Nutella Muffins, those Easy Pumpkin Danish, and this Pumpkin Snickerdoodle Cobbler steal my heart every time. 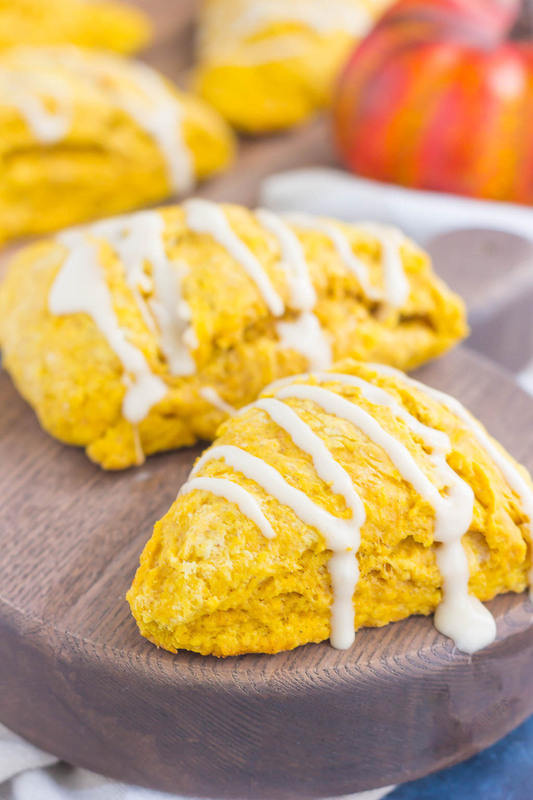 And I have some more baked deliciousness comin’ your way today…Pumpkin Scones with Maple Glaze. Now, I will admit that I’m pretty picky when it comes to scones. They can’t be too dry, too soft, or too flaky. It just ruins the idea of a scone for me…know what I mean? When I first made these Banana Bread Scones last year, I was on the hunt for that perfect scone. Luckily, through a lot of trial and error, I perfected my idea of that perfect scone. And that’s why I threw some pumpkin into the mix…to make these babies the go-to treat for fall. If the idea of making scones scares you, rest assured that this recipe is fairly easy. The hardest part is kneading the dough and cutting in the cold, cubed butter, which makes those soft and pillowy pockets burst through the scones. One bite and you’ll be hooked on the taste, texture, and cozy flavors of fall. 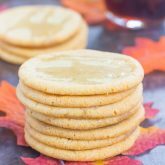 While the scones aren’t overly sweet, the maple glaze gives it that perfect touch, with a hint of sweetness. 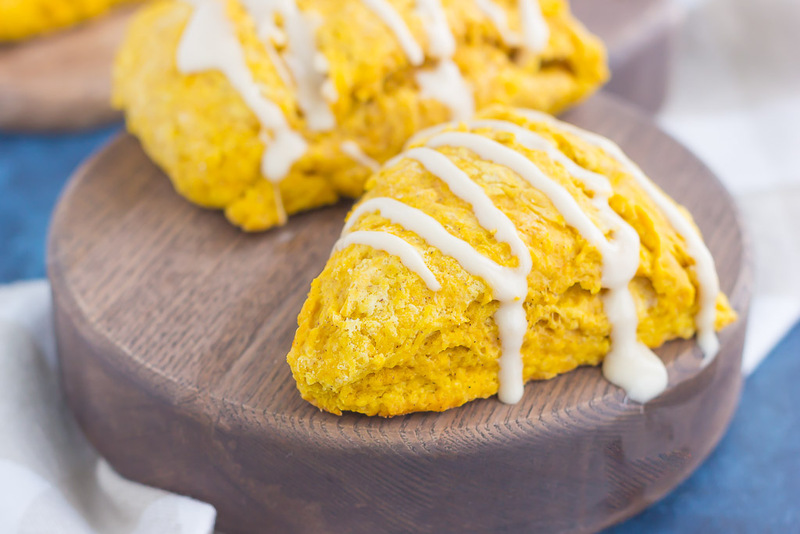 Perfect to enjoy for breakfast with your morning cup of coffee, or for dessert with a mug of tea, you’ll be reaching for these Pumpkin Scones with Maple Glaze all season long! Looking for more fall recipes? I’ve got you covered! In a medium bowl, combine the flour, brown sugar, baking powder, pumpkin pie spice, cardamom, and salt. Cut in butter with using a pastry cutter or two forks until mixture resembles coarse sand. Set aside. In another medium bowl, whisk pumpkin, egg, and milk. Make a well in the dry ingredients and pour wet ingredients in. Fold until just combined. Add more flour if dough is too sticky. Turn dough onto a floured surface and knead until smooth. Form into a flat disc, about 8 inches round, and cut into 8 pie slices. Place onto prepared baking pan. Bake for 12-15 minutes, or until scones are golden brown. To make the glaze, in a small bowl, whisk the powdered sugar, syrup, heavy cream, and vanilla extract until smooth. Drizzle or spread over cooled scones. Pumpkin season is the best season, and I wish it would last all year long! :) These scones sound like the perfect mid-morning snack with a cup of coffee. HEAVEN! 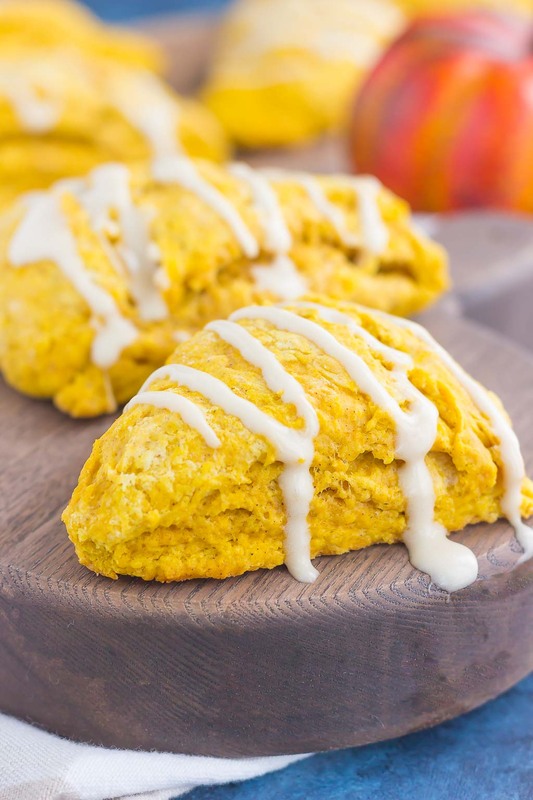 I'm always excited about pumpkin season and for me it's like all year long ;) These pumpkin scones sound amazing and that maple glaze? YES please! Ditto to Blair above - how perfect would this be with a big cuppa coffee right now? Pinned! Happy Monday! Pumpkin season is definitely better when it lasts throughout the year! Thanks for the sweet comment and pin, Dawn! I've been eating pumpkin in some form every day and I've got no intentions on stopping! I'm picky about scones too and these look so perfect. That glaze is the perfect touch and I love your video! Thanks, Marcie! Scones can be definitely be tricky, but these turned out perfect! I can't believe how close to Thanksgiving and Christmas we are! These scones look so good! Definitely going to try them this weekend! Love the video! Thanks for the sweet comment, Mira! I had a lovely scone this past weekend and I thought to myself - I need to make these! And here it is! You must have read my mind!! I love the pumpkin flavor with the maple glaze, Gayle! YUM! I would send you some if I had any leftover!